This unit is the most basic version, and has 30- and 60-minute rated cylinders. 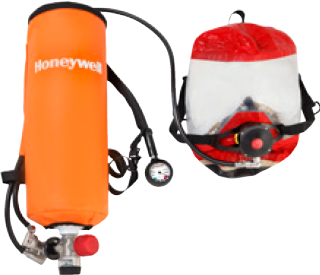 With minimal features, the ER7000 is one of the most simple and easy-to-use compliance SCBAs. Using the unit is as easy as putting it on and going in – or getting out. 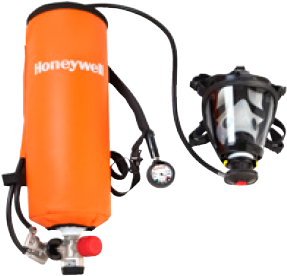 The ER7000 has a “Y” connection where the facepiece or hood connects to the cylinder, allowing the user to “leap frog” to a fresh cylinder – without losing or interrupting the air supply. This feature is great for long tunnels, where the wearer will need air for a longer time span than the rated duration of each individual cylinder. Units are intended for escape from atmospheres that are immediately dangerous to life or health (IDLH), but can also be used for both entry and use in those same environments. Uncomplicated nylon harness design is intuitive to put on and take off, and is as user-friendly as a favorite backpack. Vinyl bag holds cylinder in place and protects it from dirt and exposure to elements. Available with facepiece or tight-fitting hoods, which are ideal for workers with prescription eyewear or those who are claustrophobic.